Halloween is here again, which means costume crafting time! Rhys is currently obsessed with Tim Burton’s Nightmare Before Christmas, and has decided to dress as Jack Skellington this Halloween. 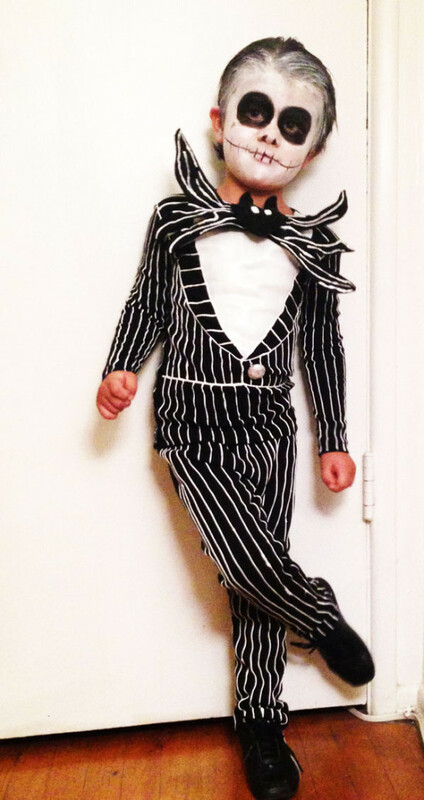 Rather than buy him a costume, I created one with a few easy to find components, and the construction was so simple! 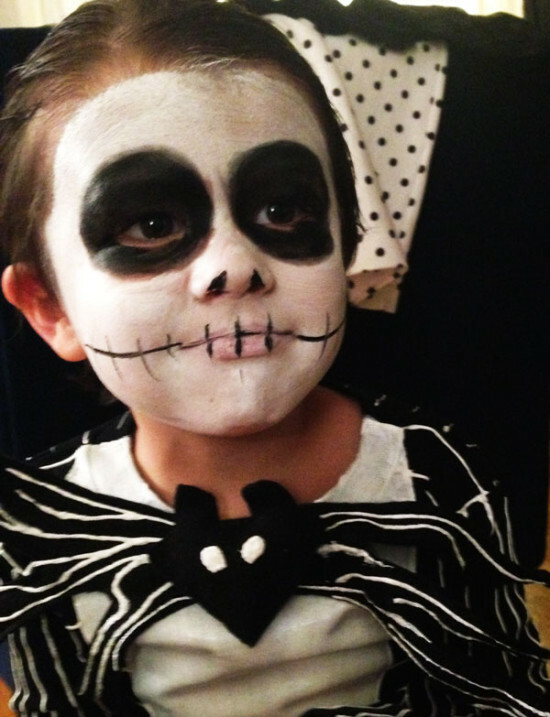 Here’s how to make a Jack Skellington costume for your little one. 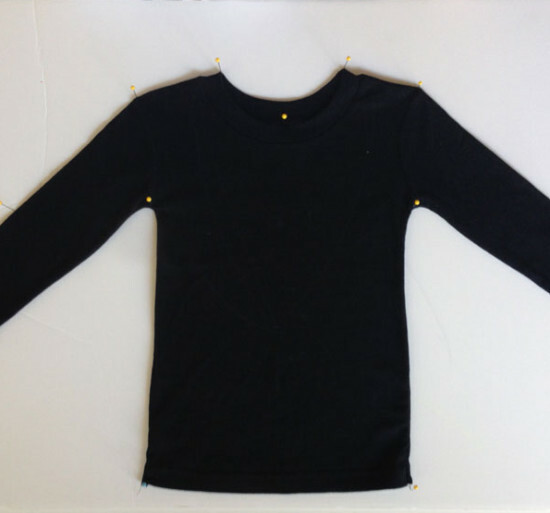 Spread the shirt and pants out smoothly on a foam board, securing the outer edges with sewing pins. 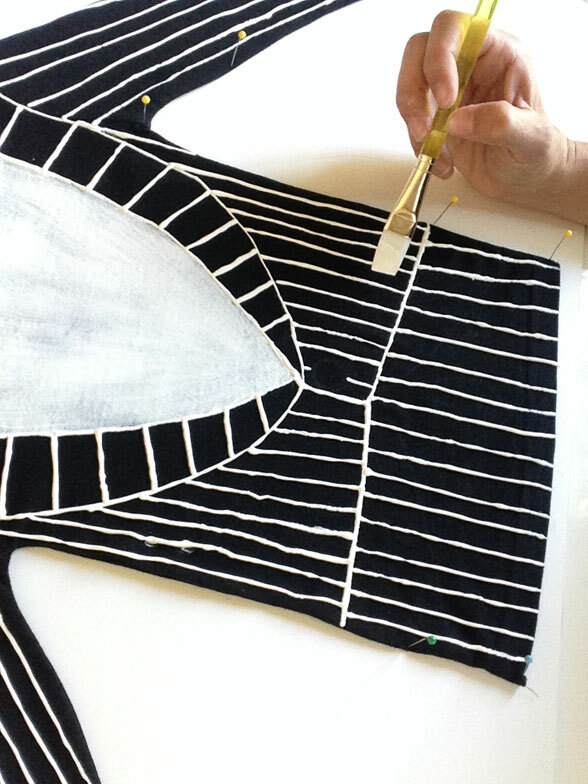 This will keep the garments flat while painting, and allow you to rotate the pieces while working. After applying paint, you can move the entire foam board out of the way, like on an upper shelf, to store during drying time. 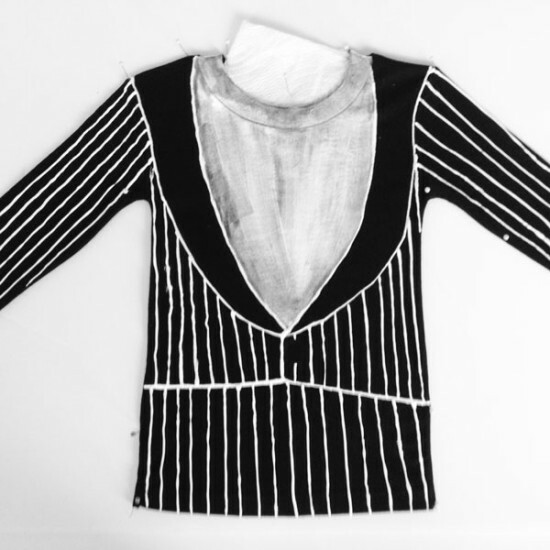 Outline lapel and bottom seam of the “tuxedo jacket” with white fabric paint. Stick a folded paper towel in the top of the shirt collar to prevent the top collar from sticking to the back of the shirt as you paint. Using a wide paintbrush, use the fabric paint to fill in “shirt.” You’ll probably need to do more than one coat to make the “shirt” look opaque, let the coats dry completely before reapplying. Leave a little space where the “lapels” for a jacket button. 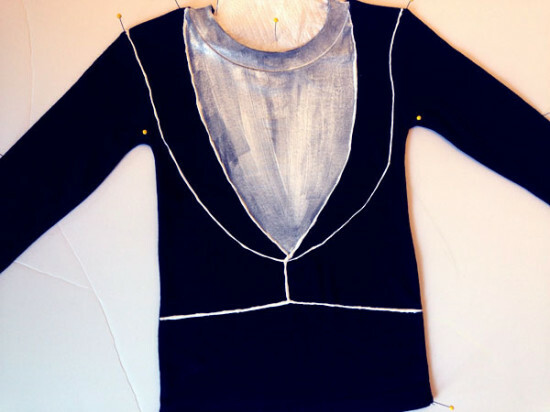 Sew the button onto the shirt when paint is completely dry. I used a fabric covered button that I painted with fabric paint, but you can always get the same effect by simply paint a round button shape where the “jacket” seams meet. 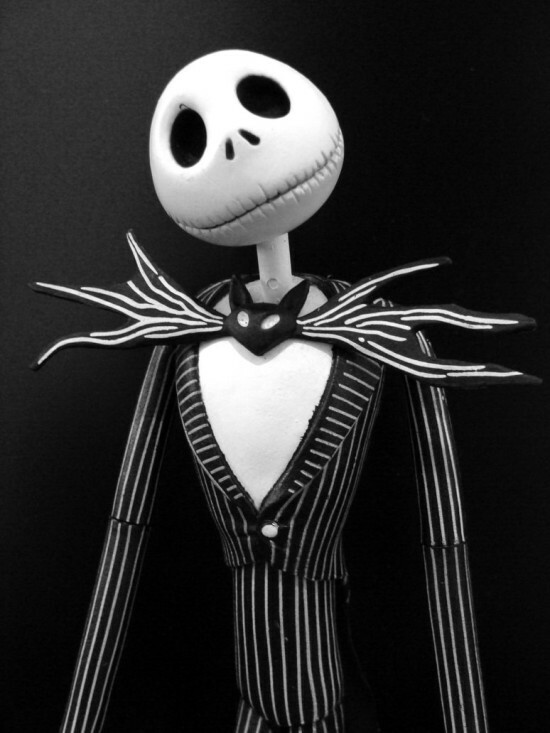 To create Jack’s bat bowtie, drawn both a bat wing and head shape on a piece of paper to use as a template. Lay the templates atop the two squares of black felt and cut out the shape about a half inch wider than your template for seam allowance. Pin one of each to your foam board, (one bat wing and one bad head), to prep for painting. 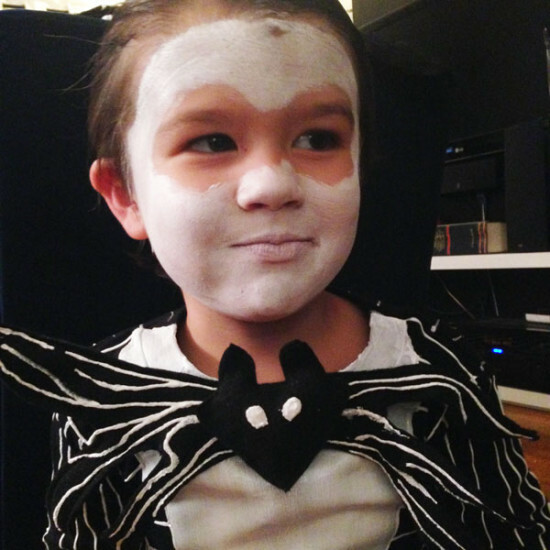 Create horizontal lines across the bat wings, and two white dots for eyes on the face. Let dry completely. 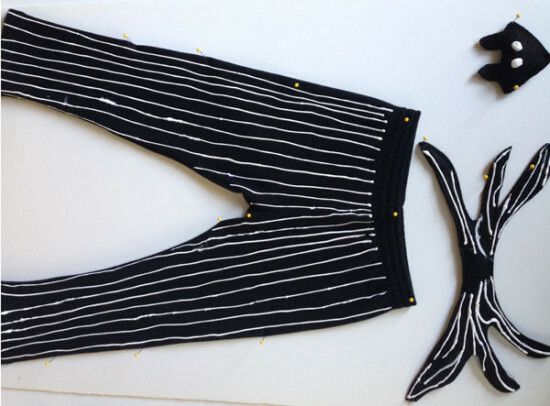 Using the same technique as before, paint vertical pinstripes on the pants. Lay the top of the bat wings on the bottom layer, and stitch all around the outer edges. (If you’re feeling extra crafty, leave an opening at the bottom to insert wire in each falange. This will allow you to bend and shape each section of the wing as you like. Sew opening closed.) With the two bat head pieces together, stitch outer edges 3/4 of the way around. 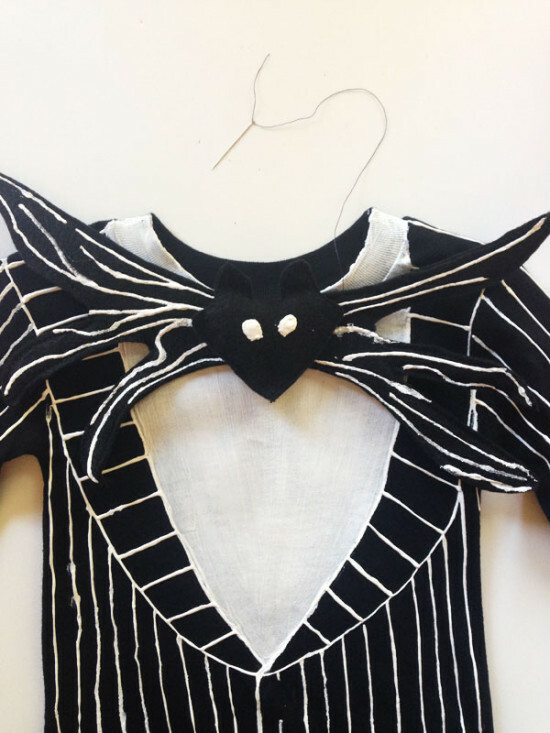 Before closing the seam, insert cotton balls or fabric scraps to give the head volume. Sew the opening closed. Stitch the head to the center of the bat. Attach to shirt with thread and needle or with a large safety pin. 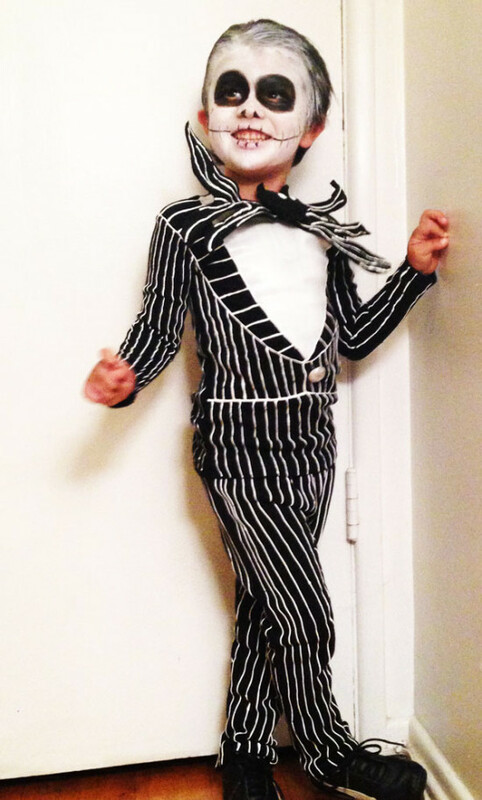 I painted Rhys’s face with white and black face makeup from MAC and used black liquid liner to draw in Jack’s skeleton smile. Um, okay. We’re all aware of the off-the-charts cuteness that is Baby Gap. I mean, I “ooh” and “ahh” in there more than I ever did at my own child. The designs are beyond adorable, and of course, they’ve outdone themselves again with a new collaboration with Birchbox. 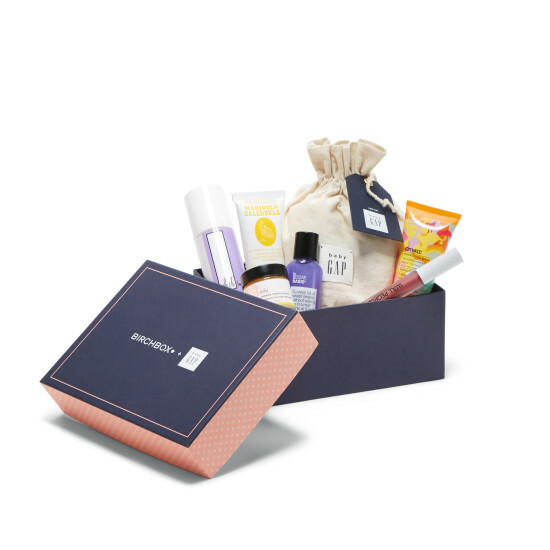 Boxes will be available for purchase for $48.00 (a value of $108) on Birchbox.com, Gap.com, and in select babyGap stores on Wednesday, March 18th, so get yours now! Ditch the usual big-box toy and game retailers! Forget the usual go-to toys and video games for kids this holiday season. It’s time to give them gifts that spark their creativity! These unusual gems will have them problem-solving, designing and creating in a flash. They best part? They’ll be having too much fun to even realize that they’re learning at the same time! Super score. For the fashionista in the family. 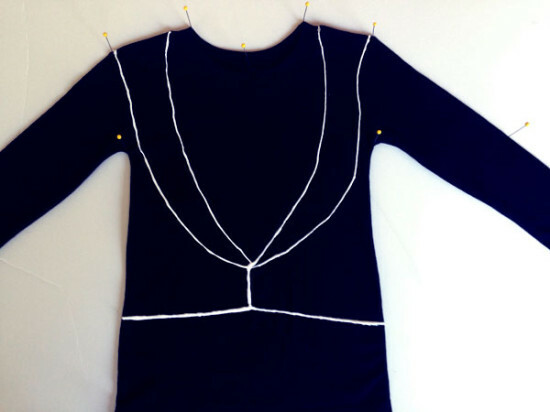 Sketching designs and draping fabric swatches atop the moveable body form will help teach movement, three-dimensional shapes, and problem-solving skills. Easy to grip by small hands, or fun to wear atop little fingertips! Give the gift of creative and colorful play that will last all day. The ultimate for the budding animator. Complete with camera, backdrops, green screen, printables and sound effects software. This will keep all the kids–big and small– entertained for hours. These magnetic acrobats will astonish kids of all ages with their balancing act. Stack ‘em up carefully and watch them defy gravity. Stack too many and get a lesson about gravity. Either way, they win! Your kids can leave a trail behind them while racing along the sidewalks. Simply screw onto the back of their bike or scooter, secure a piece of sidewalk chalk, and let them loose. They’ll love being able to see where they’ve been! 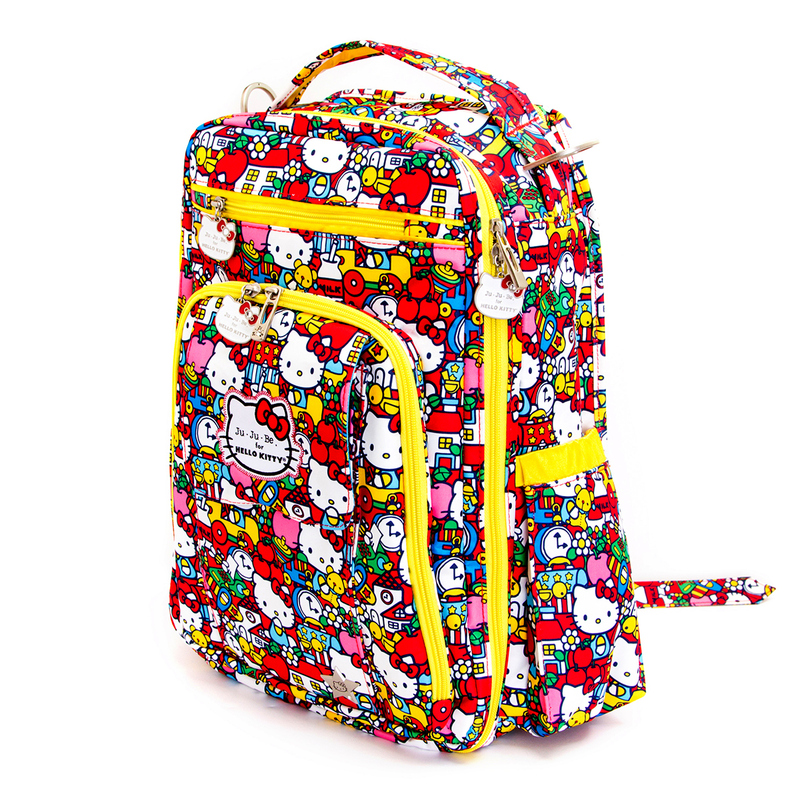 When I was a kid, I was obsessed with Hello Kitty. 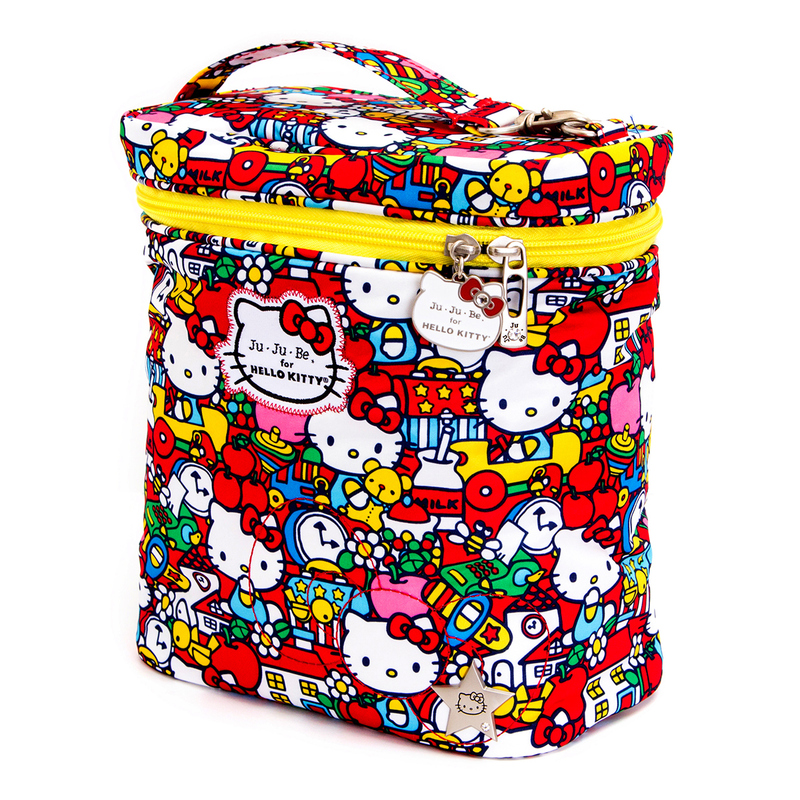 Ducking into the Sanrio store at the mall was the ultimate treat when shopping with my mom. I coveted my collected stickers, pencils, erasers, pens and pencil cases. 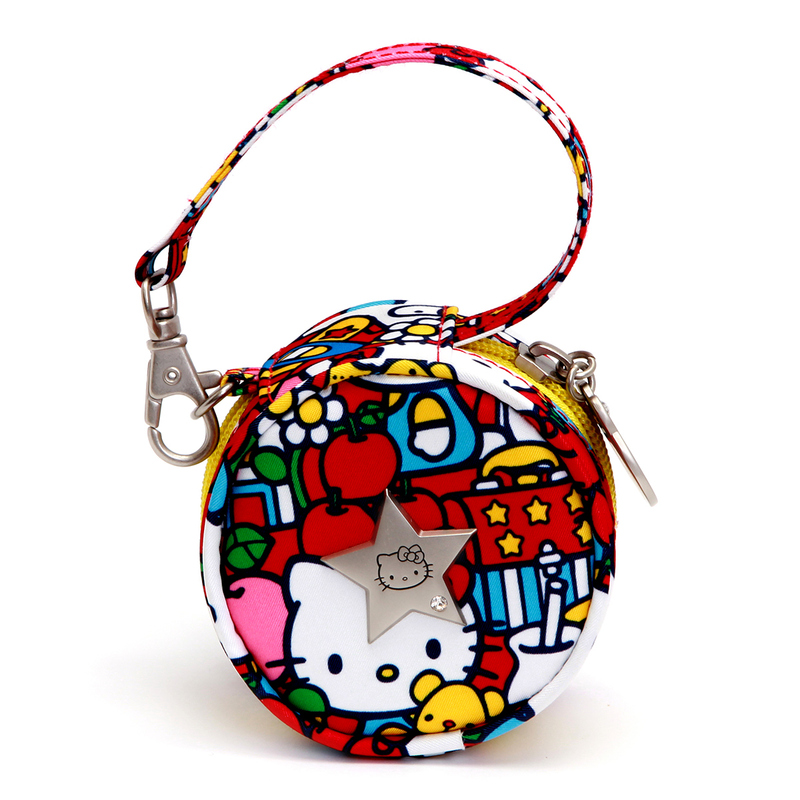 In 6th grade, it was all the trend for the girls in class to display their pristine Hello Kitty collections atop their desks in pen holders. No pencils were sharpened, no erasers rubbed against paper. All writing utensils were kept new, not meant for writing, but were purely for presentation. Stickers all remained in packaging, treated like artwork, not decoration. 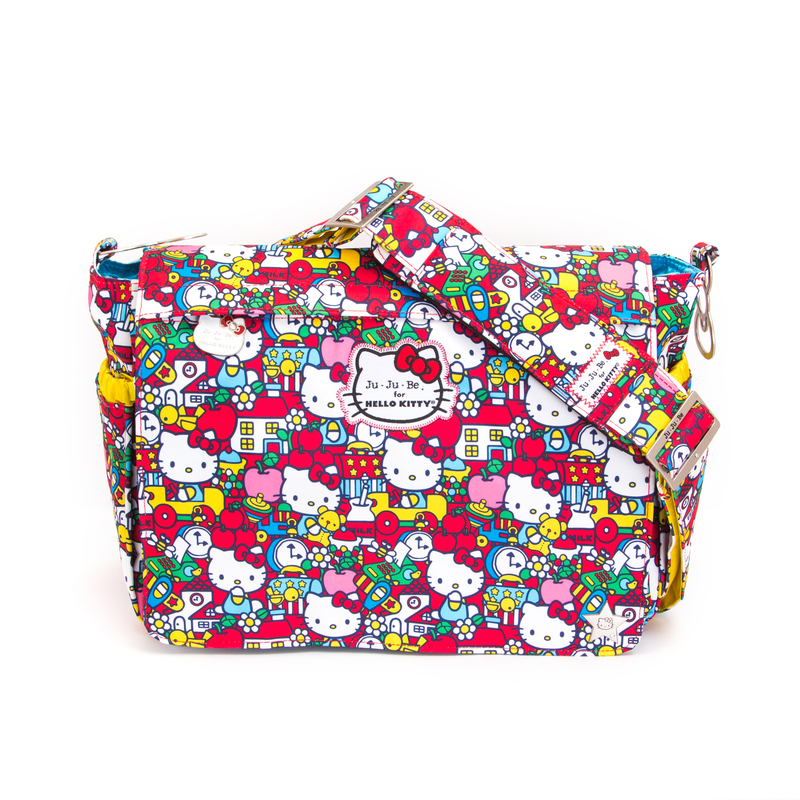 As an adult, I still have a fondness for the wide-faced cat with the bright red bow, which is why I adore the new diaper bag collaboration between Hello Kitty and Ju-Ju-Be. I was tickled to attend the launch party where I got to check out the new bags in person, and let me tell you, they are super cute. The “Tick Tock” print is cheery and bright, and boasts hidden treasures like interior embroidery details and quirky zipper pulls. 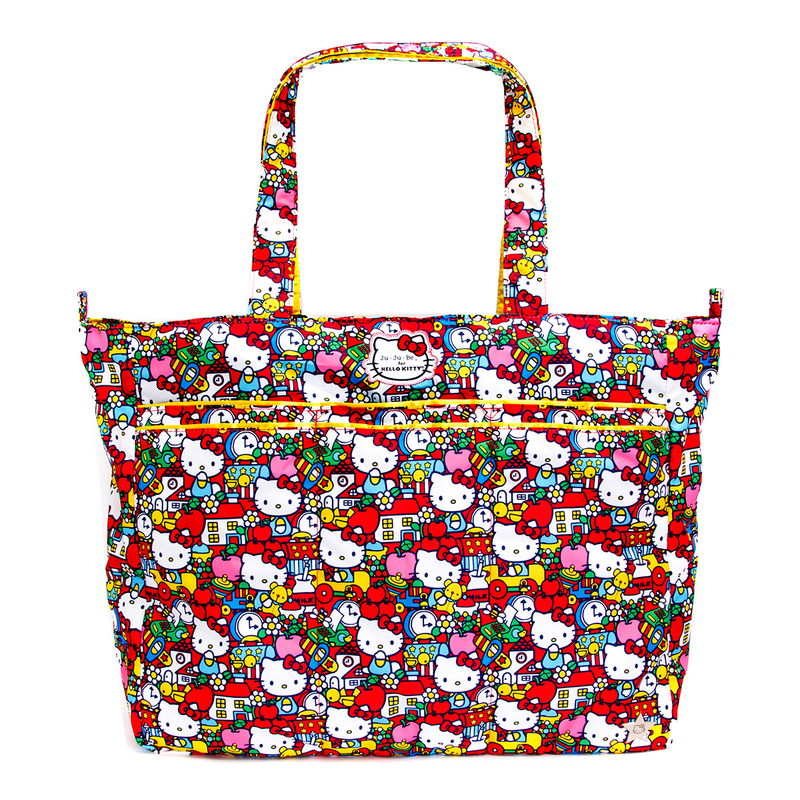 With several bag designs to choose from, there’s a perfect bag for every Hello-Kitty loving mom or child. 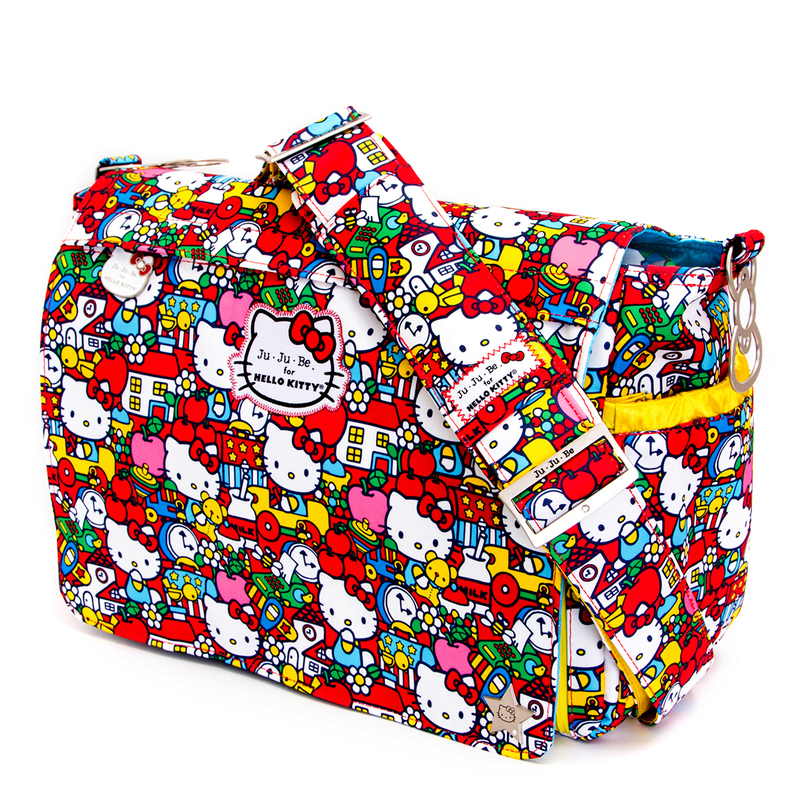 You can find all the exclusive Hello Kitty diaper bag designs at Ju-Ju-Be! As a dancer, it seems I’ve always been working up a sweat. It’s one thing to be drenched after a long rehearsal in the studio, but entirely another to feel sweaty and stinky out in the real world. It’s the worst! A proprietary blend of naturally derived enzymes neutralize and fight odor-causing bacteria. Free of artificial fragrance and gluten, Via Nature natural deodorants are vegan, cruelty-free, and never tested on animals. In roll-on ($5.99), stick ($6.99) or spray ($7.49), the formulations avoid aluminum compounds, parabens, phthalates, sulfates, synthetic dyes, triclosan and other petrochemicals. Unlike many other natural deodorant brands, Via Nature also eschews baking soda in roll-ons and sprays; baking soda can cause contact dermatitis—an uncomfortable skin reaction—in the delicate underarm area. 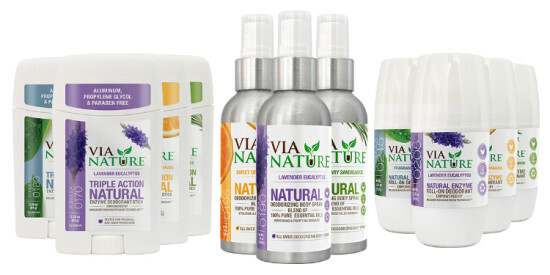 Available in three unisex scents derived from essential oils—Rosemary Sandalwood, Sweet Orange Lemongrass and Lavender Eucalyptus—as well as Fragrance Free, Via Nature natural deodorants provide all-day protection and performance you can depend on. I have such fond memories of lazy, hungover (pre-baby) brunches at The Back Door Cafe in Silver Lake. The homemade scones and gigantic cinnamon buns were off the chain, not to mention the ridiculously delicious homemade ketchup and jams. Sadly, they closed up shop several years back, and ever since, I’ve been waiting for that been vacant space to be filled. Fiiiiiiiinally that day is here. 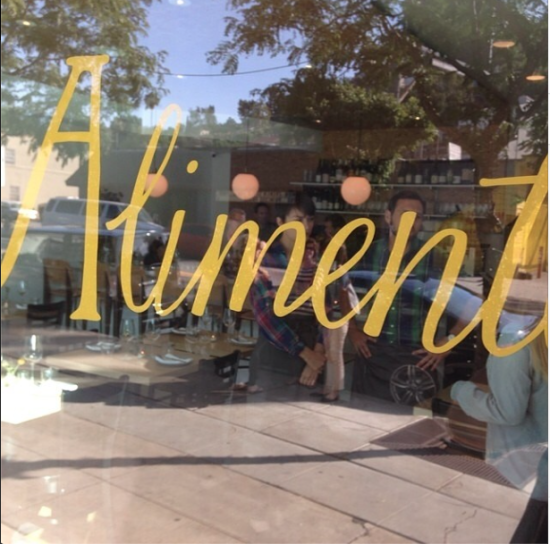 Newly added to the up-and-coming restaurant row of Silver Lake Boulevard is Alimento. 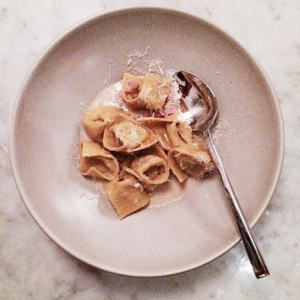 With neighbors such as LAMill, L&E Oyster Bar and soon-to-open Milk, Alimento is certainly in good company. Chef Zach Pollack has renovated my once-beloved breakfast spot, transforming the space into a bright and modern Italian eatery. 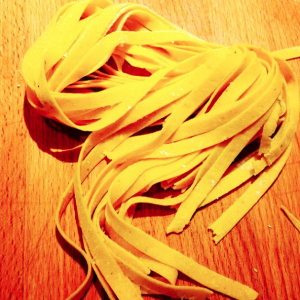 The menu will bear dishes native to several regions of Italy, serve house made pasta, panzanellas and chopped salads as well as an impressive list of biodynamic wines to sip. They’re starting off with dinner six nights a week, and I hear that they’ll eventually start doing brunch on the weekends. So when that day comes, you’ll know where to find me. It’s summertime, which means many parents are looking to sign their children up for swim lessons. If you want to splash and sing songs with your kid as a more of a social water play class, the Y and Rose Bowl Aquatic Center or any other neighborhood rec center will do you just fine. 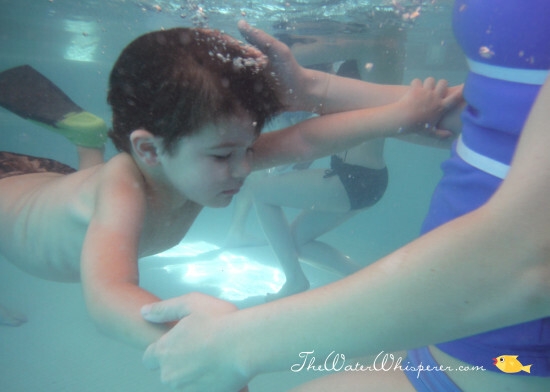 If you want your kid (or baby, for that matter), to learn to swim, and I mean SWIM, look no further than The Water Whisperer. 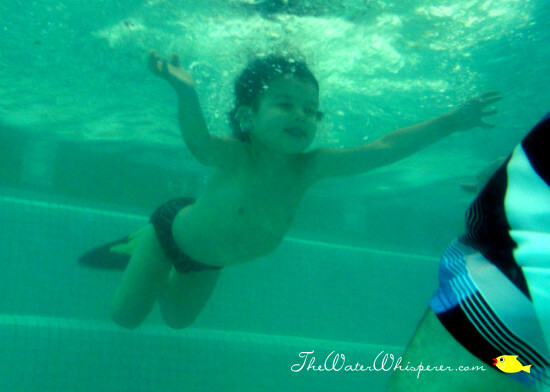 Offering a 10-day swim intensive program, The Water Whisperer is a one-of-a-kind swim school that will have your child swimming and baby water-safe by program completion. As a parent, you have to be completely ready for all the program entails, which includes full submersions, so if the idea of having your child plunged beneath the surface of the water makes you nervous, prepare yourself. Owner Emily Cohen has created a swim school with that is far and above what you might find at any other neighborhood swim lesson. Focusing on helping babies and children to feel safe and secure in the water, while encouraging them to push themselves beyond their comfort zone is the core of the school’s mission. They speak in terms children easily understand and use props to demonstrate exercises and swim fundamentals so the kids can better grasp the concepts presented to them. The 10-day intensive program teaches paddling and arm strokes, kicking, floating and breath control and more. Children learn to reach for the edge of the pool as a place of rest and safety, and how to safely crawl out of the pool from the edge. I brought Rhys to the Water Whisperer in March 2014 for the 10-day intensive. On day one, he cried so much I was asked to leave the immediate pool area to not distract him. Day two was less traumatic, though I still waited in the wings as he was instructed the incredibly well-trained swim teachers. Breathing exercises include submersions to “rescue” toys from the lower steps of the pool, eventually moving deeper to the bottom of the shallow end. Here’s Rhys picking up not one, but four toys all in one breath on day two. Day four he was diving from the edge of the pool to retrieve toys from the deep end. I mean, are you kidding me? The sense of pride and accomplishment Rhys felt after each lesson was palpable, obvious by his ear-to-ear grin and skip in his step. Knowing my son is water-safe–that if he were to fall into a pool unexpectedly one day and be able to get himself to safety–gives me great peace of mind. I have Emily and the staff at the Water Whisperer to thank for that. I truly can’t recommend this school highly enough. I will return with Rhys to refine his skills, to learn the four swim strokes, to perhaps eventually join the swim team; I certainly will bring any other little Fausets if any happen to join our family in the future. 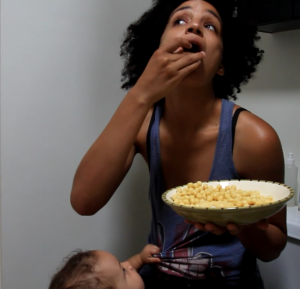 As moms, we are endlessly busy. It’s tricky to manage a household, shuttle your little ones to and fro, balance work, your relationship and all the other things we do on the daily. It’s no surprise that I’m always looking to hack my routine–to find a quicker way to get things done–in order to stock up some quiet time for myself. But where to cut corners? Not on mopping the kitchen floor, that’s for sure. 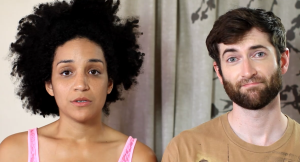 What if you didn’t have to go to the grocery store? Imagine that world: No children to drive to the store, then put in the cart against their will. No tantrums over cereal boxes bearing cartoon characters, no leering eyes from strangers at your child’s inability to understand why you’re not buying him candy, no checkout lines. Sounds dreamy, right? I reveal in the days I can go to the grocery store without my son. I truly do. But while I enjoy the freedom and the quiet of perusing the aisles at my leisure, it’s not quite how I’d prefer to spend time alone. What if it were possible to outsource grocery shopping and use the time saved to do something truly worthwhile? Boom! 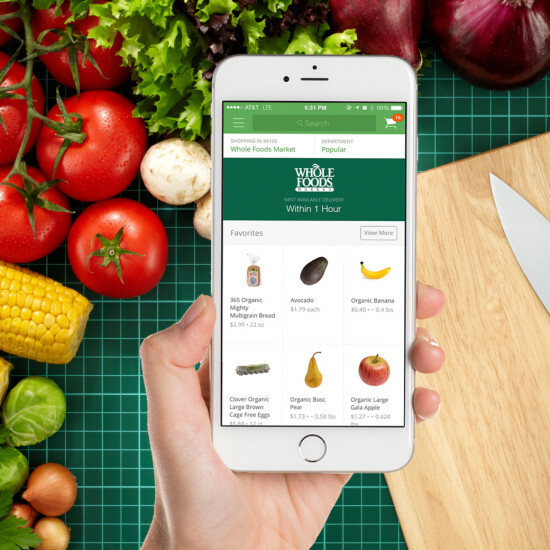 Meet Instacart, a same-day grocery delivery service from stores at which you likely already shop: Whole Foods, Ralph’s, Costco (no membership needed!) It’s so simple to use–just search the items you need, choose from the results, and add to cart. with easy access from your smart phone, tablet or computer. Shop from anywhere! Add to cart from dance studio or soccer field. Shop from the car wash or dentist’s waiting room! Instacart will review your order before it’s final and give you the option to choose substitutions in the event your first choices are unavailable, or to select “no substitution”, so you can be in total control of what you receive. Once you’ve filled you cart, choose a delivery date and window that works best with your schedule. If your shopper has any questions, they’ll call or text you from the store; when the shopping is completed, you’ll receive an alert that your delivery is on the way with an estimated arrival time. Voila! Groceries without the hassle. Instacart has been my super-secret time saver, and now I’m sharing it with you! Go to Instcart and use the code SILVERLAKEMOM for $5 off and free delivery on your first order. (New customers only.) Give it a try and let me know what you think in the comments below.